A few bio details concerning MSNBC's Chief Legal Correspondent Ari Melber are available for the curious. Mr Melber has a 39th birthday upcoming - born March 31, 1980 in Seattle, Washington. 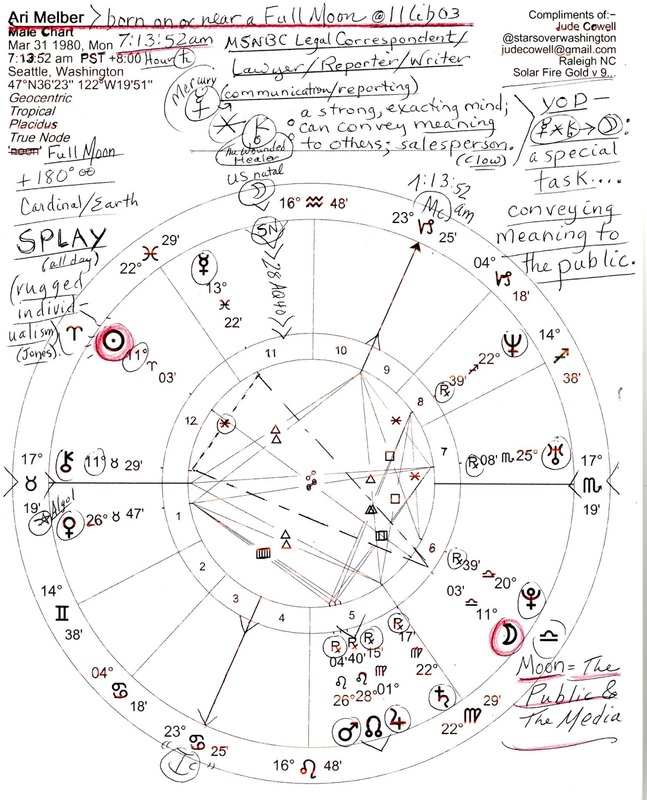 Below you see a speculative natal horoscope for Ari Melber as timed by that day's Full Moon which perfected @11Lib03 at 7:13:52 am PST in Seattle; I'm not going to make a big deal about the chart but here it is in case anyone ever wants it--the Full Moon version, that is. 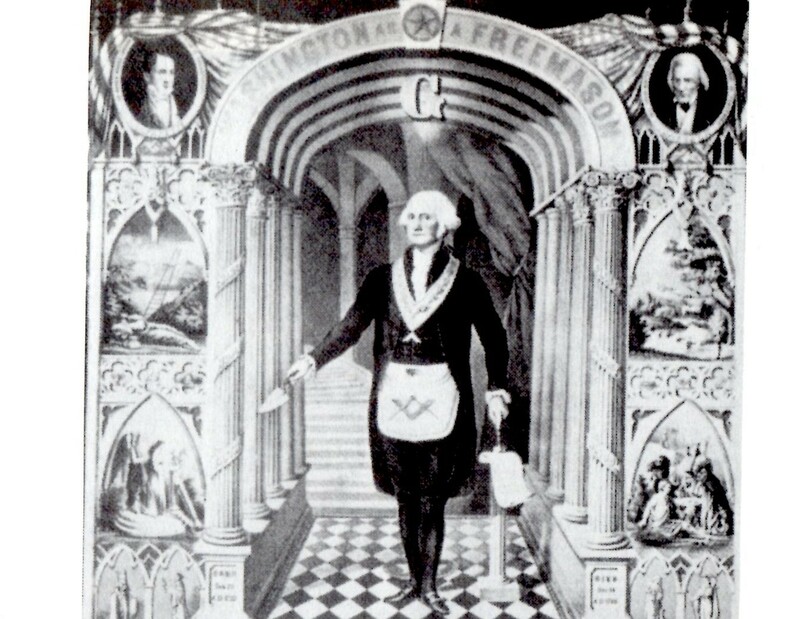 Because to me, his day of birth is cosmically imprinted with the rays of a Full Moon @11Lib03, no matter his accurate hour and minute of birth. Any other speculation on Ari's birth time is up to you so have at it! As you see penned on the chart (messily as usual! 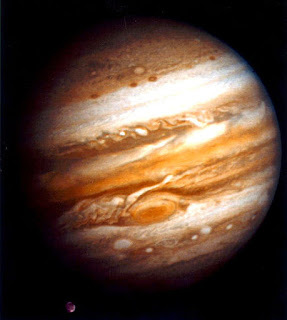 ), his planet of communication and reporting (on TV, no less--he's quite photogenic), Mercury @13Pis22 sextiles Chiron and forms the base of a YOD pattern that points toward the Libran Moon (the public; publicity) and this, I assert, describes Ari Melber's special task in life. What do you think? 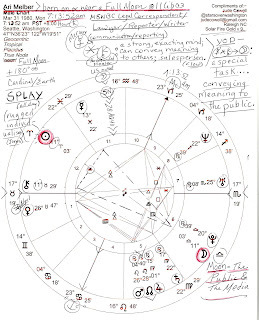 See chart for sextile details provided by Barbara Hand Clow (as notated above the natal chart). 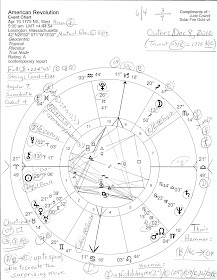 And since the page linked above states that Mr. Melber married in 2014, divorced in 2017, I'll gingerly mention that his chart displays a telling Venus-Uranus opposition which tends a native toward problematic relationships that, in order to last, must be supported by stability from other factors in the chart and psyche for best results. A strong, sober Saturn is always helpful - his Rx in critical, discerning Mercury-ruled Virgo, and in wide opposition with thinking Mercury in creative Pisces. Yet with any contact between lovely Venus and quirky Uranus, relationships can be and usually are, exciting while they last! Then what about his Sun Aries-Moon Libra personality blend of conscious and unconscious energies? Some personality traits can be seen on his MSNBC show The Beat, Ari's love of rap music is well known, and music references tend to turn up on his show in segments and in his commentary. His is a Fire-Air blend, full of exciting ideas that he communicates easily and with zeal. Idealism, optimism, and a charming hospitality may be noticed on screen (and one presumes in person) along with a vivacious streak of chivalry (hero complex? ), plus, a large dose of ingeniousness is apparent. Dependence vs independence in relationships (Aries-Libra) proves an important theme in life, though in youth Ari may have been a bit of a flirt. And actually, a Libran Moon person can become quite detached and this coolness tends to attract emotional outbursts from others. Others like the ladies! Still, as an adult Mr. Melber naturally prefers to be in a 'good' relationship (Sun Sign Moon Sign, Charles and Suzi Harvey). "A conductor leads an orchestra with passionate conviction and a vibrant pulsating organism of musical perfection is created to the ecstatic uplifting of the audience." Yes, pulsating like The Beat! "The love of liberty is the love of others; the love of power is the love of ourselves." And, "The art of pleasing consists in being pleased." - essayest William Hazlitt. Chart Note: the earliest (12:00 am pst) position of the Sun on March 31, 1980 in Seattle, WA: 10Ari45, earliest Moon position = 7Lib29); the latest (11:59 pm pst) Sun and Moon positions are: 11Ari44 and 19Lib21 conjunct Pluto Rx @20lib39 which, in self-aware folk, can give great psychological insight into the psyches of others and an endless well of creativity, yet may also hint at a mother who smothered. Perhaps all three!